“Veganuary”, whereby people give up meat or animal products for the month of January, has gained popularity over the past few years. Recently, in particular, it has received a considerable amount of attention in the press, partly as a result of a particularly well-known purveyor of doughnuts and pasties releasing a vegan version of their most popular line. Regardless of your preference for baked goods, more and more people are cutting out or cutting down on the amount of meat they’re eating for either health, ethical or environmental reasons. It can, however, be difficult to tell which wines are vegan-friendly, and why some might not be. So what makes a wine vegan? Animal-based additives are often used to clarify a wine, a process which is known as fining. Without this process, most wines would appear a little bit hazy; something that might be seen as a fault – historically, at least – by many wine drinkers. When added to unfinished wine, these additives – or fining agents – cling onto the (naturally occurring) particles that cause the cloudiness – such as yeast cells or microscopic pieces of grape, thereby allowing them to “settle out” or be filtered out more easily. Some of the most commonly used fining agents include isinglass (obtained from the swim bladders of fish), albumen (egg white) or gelatine. Although the fining agents aren’t in the final wine, the fact that animal products have been used in the winemaking process rule these out for strict vegans. Currently winemakers aren’t legally required to state on their labels whether wines are suitable for vegetarians or vegans; however, many winemakers nowadays are adapting their winemaking techniques or using production methods which negate the need for animal-based products – either allowing the wine to settle naturally (thus avoiding any additives at all), or more frequently by using an alternative such as bentonite (a type of clay). With an increasing number of people choosing a vegan or vegetarian lifestyle, it may only be a matter of time until this changes. 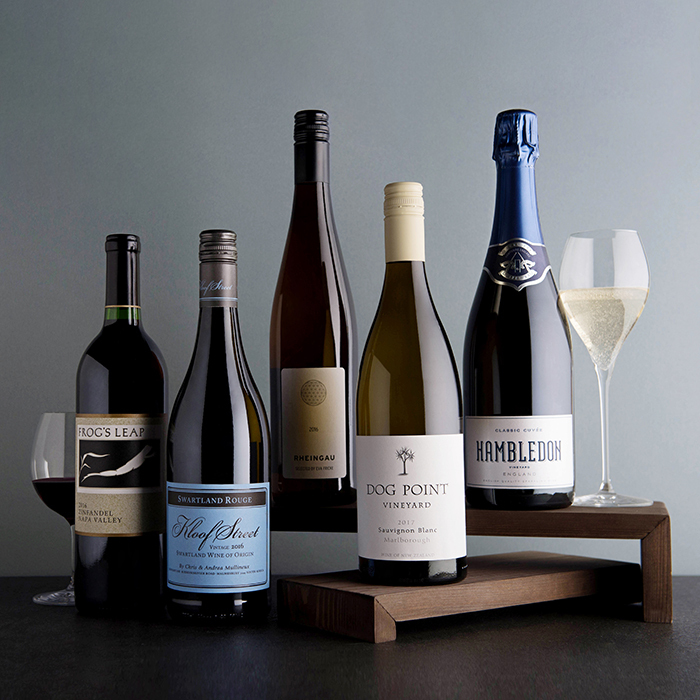 For now, however, here are five wines from our range that not only work well with a variety of vegetarian and vegan cuisine, but are produced using vegan-friendly methods. 2016 Rheingau Riesling, Selected by Eva Fricke, Rheingau, Germany: At this time of year, while recovering from the excesses of Christmas, lighter southeast-Asian-inspired dishes and stir-frys become a regular part of my meal plan. This organically certified aromatic Riesling has a refined floral character with a refreshing lime zing that lends itself perfectly to classic pho dishes or stir-frys. 2016 Mullineux, Kloof Street Red, Swartland, South Africa: This big, juicy red from South Africa is a classic southern Rhône blend. It would be an amazing pairing for mushrooms stuffed with black rice, sprinkled lavishly with vegan parmesan. The heartiness of the wine will work wonders with the meaty texture of the mushrooms and the punchiness of the cheese. 2017 Dog Point, Sauvignon Blanc, Marlborough, New Zealand: Sauvignon Blanc is a surprisingly versatile grape that makes it a perfect match for a host of salads as well as veggie burgers and asparagus. This wine has the classic Sauvignon zip of fresh acidity backed up by loads of ripe tropical fruit character. 2016 Frog’s Leap, Zinfandel, Napa Valley, California: Zinfandel is increasingly becoming one of my favourite red grapes, with this wine topping the list. Loads of lush, ripe fruit with hints of spiciness would make this a go-to pairing for a variety of Indian or Mexican dishes, but it would also stand up nicely to tomato-based pasta dishes. It’s certified organic as well. Hambledon, Classic Cuvée, Sparkling, Hampshire, England: Let’s be honest, do you really need to use the excuse of food to have a glass of fizz? Probably not. With plenty of ripe apple and greengage character and subtle notes of biscuit, this is perfect as an apéritif or served alongside anything else that takes your fancy really. Delicious. Fascinating! Will be trying these for sure!